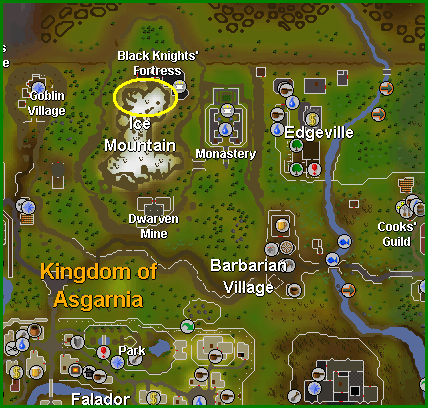 If you are looking for the modern RuneScape guide for this content, please see our Dragon Slayer guide. Prove yourself a true hero. Kill the mighty dragon Elvarg of Crandor Island and earn the right to buy and wear the powerful rune platebody. To start this adventure, talk to the Guild Master who can be found in the Champions' Guild. The guild can be found by following the map above. Ask him about the rune platemail. 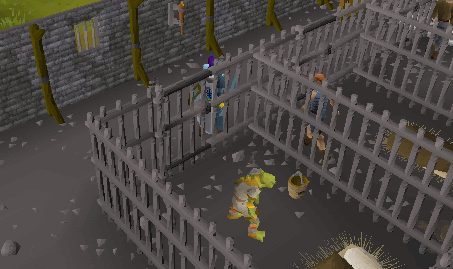 Oziach can be found in Edgeville. Follow the map above, and he can be found in his house that has a yellow circle surrounding it. Tell Oziach that the Guild Master told you about him, and the rune platemail. Oziach wants you to prove yourself, by slaying the legendary Elvarg the Dragon. Ask if there is anything you need, and Oziach recommends an anti-dragon shield. Dragons breathe harmful fire, of course! This mother dragon called Elvarg can be found on Crandor Isle, but you will need a map to follow to know how to get there. The map has been torn into 3 pieces, which you will need to find. Oziach will now tell you that the Guild Master has the key to Melzar's Maze. Find your way back to the start of the quest and talk to the Guild Master. He will give you a maze key! To fight a dangerous dragon, you will need a good shield to protect you from the dangerous fire breath. 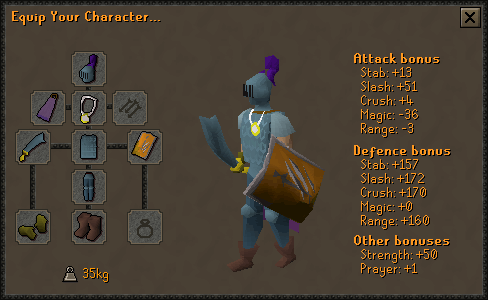 Duke Horacio of Lumbridge has the anti-dragon shield that you will need. 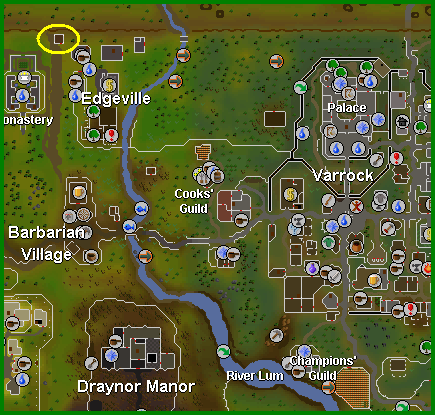 To get to Lumbridge, easily cast the Home Teleport spell and you will arrive at the courtyard of the castle. The Duke is located on the second floor of his castle. After a chat, you will receive the anti-dragon shield. Take care of it. This is the hardest map piece to obtain, as it requires a killing powerful demon. Come prepared with some decent food like lobsters, swordfish or tuna, some good armour and a decent weapon. If you have a high enough magic level, bringing teleport runes will ensure your safety. 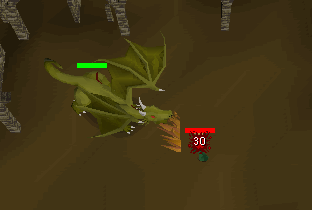 You do not need the anti dragon shield to fight the demon. Now that you are prepared with your equipment, it's time to get the map piece. The map piece is found in Melzar's Maze, and you'll need the Maze Key that was given to you earlier by Oziach to enter the maze. The maze can be found by following the map above. Once you arrive, use the maze key with the door to enter. Tip: If you have lost your maze key, return to the Guild Master and ask him for another. Now, you'll need to kill the giant rats in the room until one of them drops a red key. Once you have the red key, use it with the door in the northwest corner of the room and climb the ladder. Next, kill the ghosts until they drop an orange key. Once the key is dropped, pick it up and use it on the door second from the north on the east wall. Head up the ladder in the small room after opening the door. After that, kill the skeletons until they drop a yellow key, which you'll need to use to open the southwest door. Next, head down the next three ladders. Finally, you'll enter a room with many zombies. Begin to kill zombies until they drop a blue key. 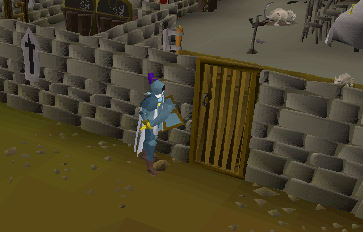 Use the key with the blue painted door and you will enter a new room. A level-43 Melzar the Mad will attack you, and he will say all sorts of very funny things. Once he is dead, get prepared for the hardest battle. Once you're ready, use the key dropped by Melzar with the door and slay the level-82 lesser demon. It will drop a green key, which you can use on the last door. Now, open and search the chest to obtain the first map piece! Congratulations! The holder of the second map piece is the Oracle. She can be found on Ice Mountain. Follow the map above. His location is the yellow circle. Once you arrive, bring up the subject of the map piece. Wizard's Mind Bomb - bought from the Falador pub for 3gp. Lobster Pot - bought from the fishing shops in Port Sarim and Catherby. Unfired Bowl - made by using soft clay on a pottery wheel and selecting bowl. Silk - it costs 32gp in a General Store, 2gp from the Silk Trader in Al Kharid if you haggle, and 30gp from the Clothing Store in Varrock. Once you have all of those items, head into the Dwarven Mines, which can be seen on the map above. Climb down the ladder and head into the room, circled in yellow, on the map below. Open and search the chest, and you will have Thelzar's map piece! Congratulations! We've saved the easiest for last! Lozar's Map Piece requires you simply to have 10,000gp if you don't have level-31 Magic or higher. Alternatively, if you have level-33 Magic or higher, you'll need one law rune and one air rune. If you magic level is 31 or 32, bring a Wizard's Mind Bomb to help boost your magic level. If you are not paying the 10,000gp, items for magic or ranged attacks are needed. Once you have all the required items, head to the Port Sarim jail. Following the map below will bring you there. Once you get there, go to the third cell south and you will see Wormbrain. If you have brought magic or range attack and your telekinetic grab runes (with a wizards' mind bomb if your magic level is 31 or 32), start shooting your spells or arrows at Wormbrain until he is dead. Once he is finished off, cast your telekinetic grab spell then click on the map piece. Congratulations! If you have brought 10,000gp, simply talk to Wormbrain and buy the map piece for a hefty price of 10,000 coins! Congratulations! 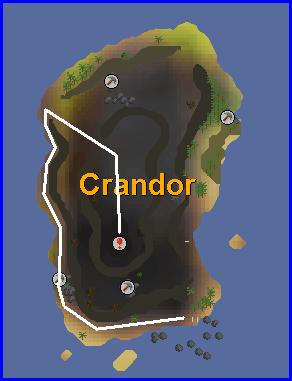 Now that you've retrieved all of the Crandor map pieces, you need a boat to get to the Island! 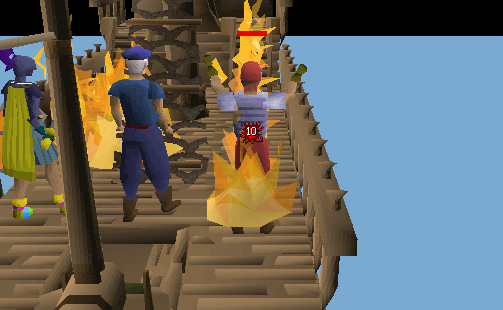 Klarense in Port Sarim (where you found Wormbrain) is the answer to your prayers. Follow the map below and Klarense is in the yellow circle. 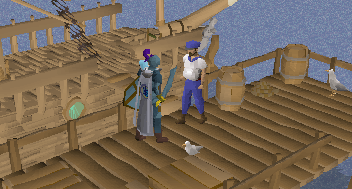 Talk to him about buying the boat, and he will put a 2,000gp price tag on the boat. 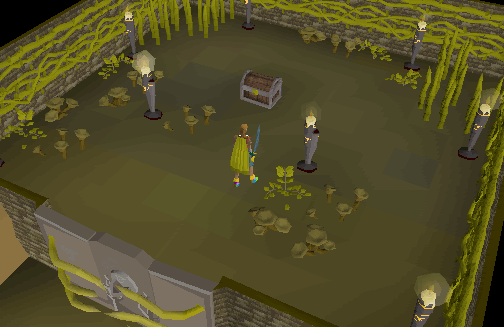 3 planks - planks can be found in the Graveyard of Shadows, which is in level-19 wilderness. 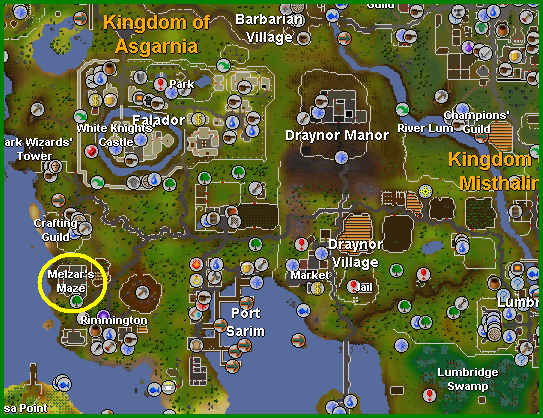 They can also be obtained by taking a log with some coins to the Sawmill Operator northeast of Varrock, or picked up on Entrana. 90 steel nails - these can be smithed with a steel bar, or bought from other players. Once you have obtained those items, go back to the boat with them. Use each plank on the hole and the boat will be fixed! Well done! The Lady Lumbridge is now ready to set sail! If you use the map pieces with each other, they will turn into a Crandor map. For this next part, you'll need to talk to Ned, who can be found in his house in Draynor Village. By following the map above you will be able to find Ned. 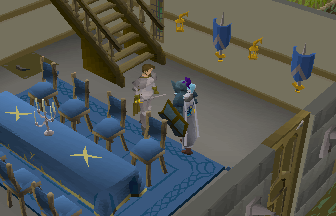 After talking to him, he'll take your map and will meet you at the Lady Lumbridge. A Combat level of at least 40-50. 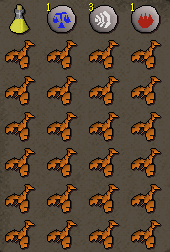 Lobsters or swordfish to heal big amounts of damage. The dragon can hit up to 10 damage! A strength potion is optional but will really help you. You could also bring some emergency teleport runes incase something goes wrong. Note: You can use the dragonfire shield (members only) as well. 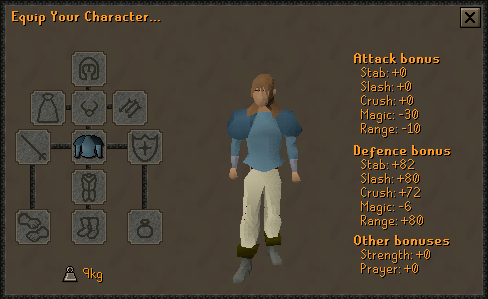 Once you're all kitted up, head to Ned at the Lady Lumbridge. Go below the deck and you will set sail for Crandor! Unfortunately, the dragon will attack the boat with fire breath and kill Cabin Boy Jenkins! You will be forced to run away, and will wash up on Crandor. Ned appears to be missing, too! Now, make your way to the cave entrance by following the map below. 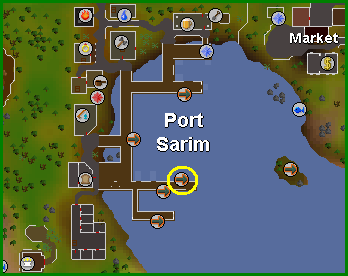 Note: If you have fixed the boat and crashed it, you can use the shortcut wall under the Karamja Volcano. It is a much faster way to get to the dragon again if you die. Once you've headed down into the volcano, go southeast for a while until you see a wall. Now is the time to take a dose of strength potion, if you have one. Wield your anti dragon shield and activate prayers, such as ultimate strength and protection from melee or magic. The dragon uses a mixture of both. 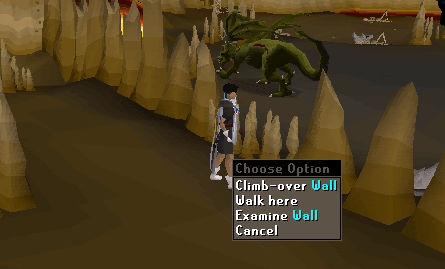 Once you're ready, head into the area and start attacking Elvarg. Don't let your hitpoints get too low! After a long battle, Elvarg will hopefully be defeated. If it's the latter, you will cut off the dragon's head. You'll need to find your way back to Oziach, and after talking to him, congratulations, quest complete! 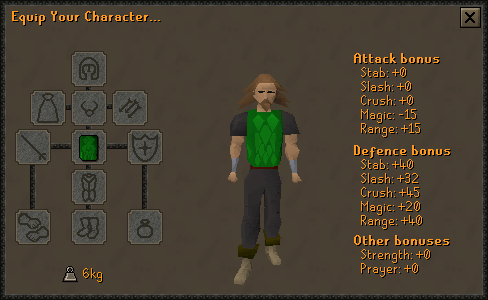 18,650 Strength experience 18,650 Defence experience The ability to wear the Rune Platebody and the Green D'hide Body. Upon completion of the quest, you will have the ability to buy and wield the rune platemail. You can buy it cheap from players or expensive from Oziach for 84,500gp! As you can see, the platemail's stats are quite impressive! As well as the rune platemail, the green dragonhide body can be worn upon completion of this adventure. As the stats below clearly state, dragonhide provides excellent magic protection. You can buy a green dragonhide body from Oziach, or from another player. [^] Speak to the Guild Master in the Champions' Guild. [^] Go to Oziach and talk to him about the platemail. [^] Go back to the Guild Master and get the maze key. 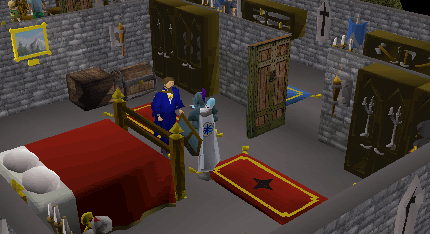 [^] Talk to Duke Horacio in the Lumbridge Castle to receive an anti dragon shield. [^] Go to Rimmington and enter Melzar's Maze. [^] Work your way through the maze by killing the monsters and opening the doors with the keys they drop. Next, kill the lesser demon to get the first map piece. [^] Talk to the Oracle. [^] Go to the Dwarven Mines with the items, and enter a room to obtain the second map piece. 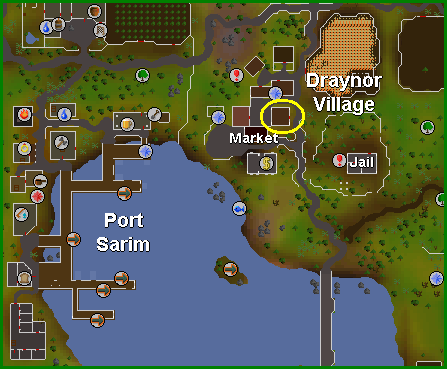 [^] Go to Port Sarim jail where you will find Wormbrain and obtain the third map piece. 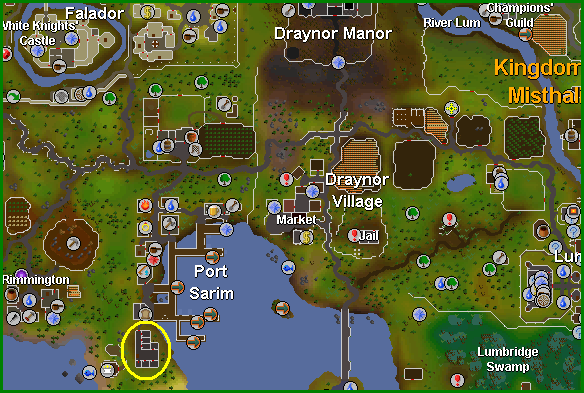 [^] Talk to Klarense in Port Sarim and buy the Lady Lumbridge. 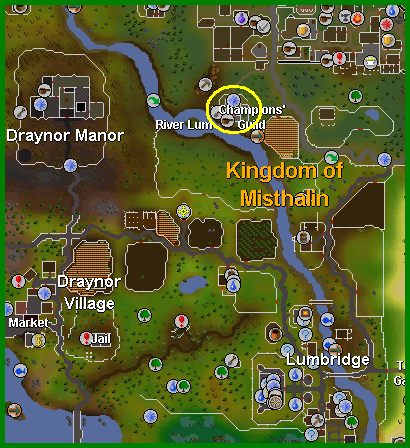 [^] Fix the Lady Lumbridge. [^] Talk to Ned in Draynor about the quest. [^] Prepare your equipment for the battle, and check if you have the required levels. [^] Go to the Lady Lumbridge. [^] Go to the cave entrance and climb down. [^] Prepare yourself for the last time. [^] Fight the dragon until it is dead. [^] Take the cut off head to Oziach to receive to complete the quest!